OK, so hands up, is your little one a Peppa Pig fan? As much as Peppa’s snort annoys me, my daughter loves her, and of course her brother George. You may remember we reviewed Peppa’s Laugh and Learn Alphaphonics a while back, and it’s still a much played learning toy in our house. Well today I’m happy to let you in on the new Peppa’s Secret Surprise. 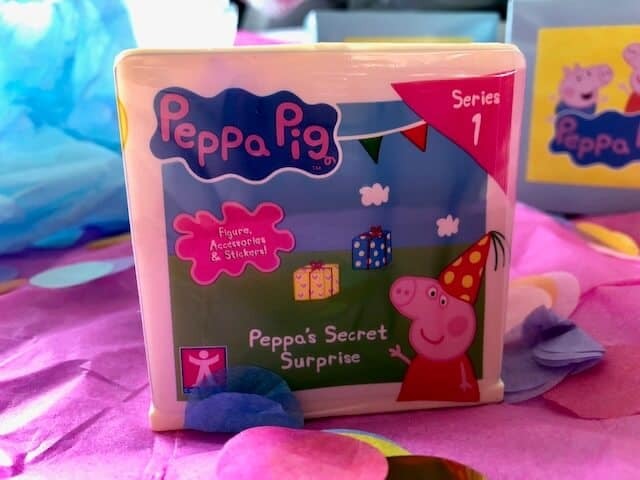 Yes you heard that right, Peppa’s Secret Surprise is launching December and we are extremely happy to be a part of it! 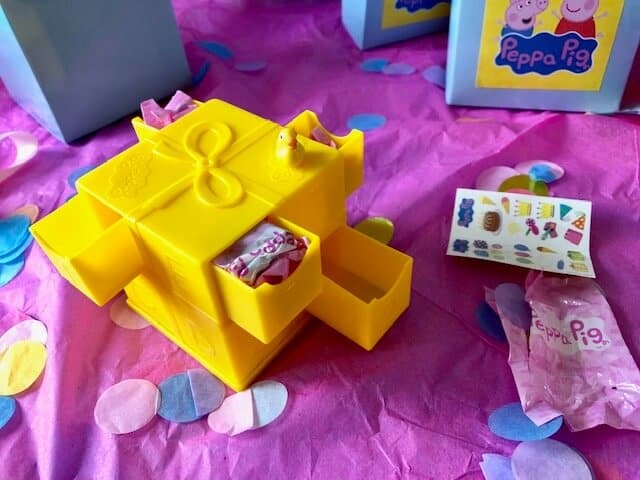 Before I share with you our little review, here is a little bit about the Peppa Secret Surprise. 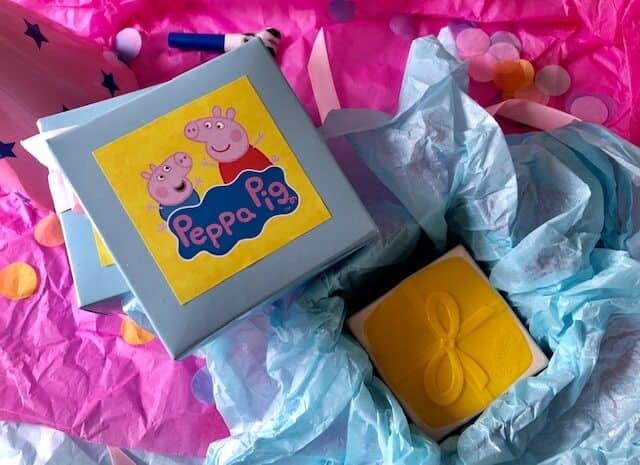 Peppa’s Secret Surprise is set to bring today’s love of unboxing to the pre-school aisle with a regular role out of boxes full of Peppa pig surprises that fans of the TV show will adore. 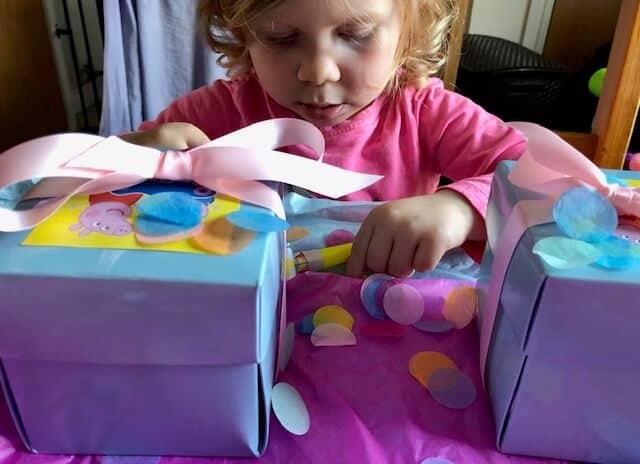 Unwrap and reveal the cube-shaped present and discover the six hidden drawers in which five secret blind bagged toys, plus a fun sticker sheet can be found. This is the surprise present that just keeps on giving as the child discovers exclusive figures in glittery party outfits. 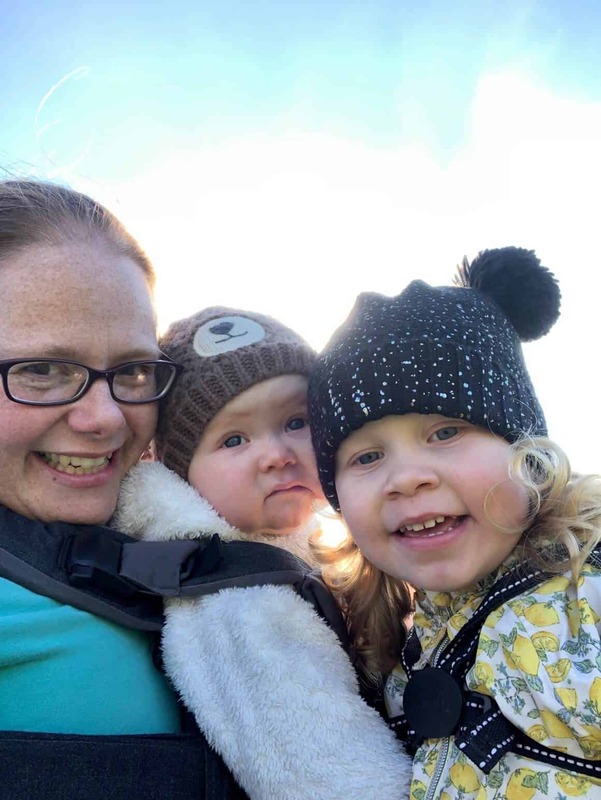 Children will be able to hunt for Peppa Pig and her friends including Peppa, Suzy Sheep, Rebecca Rabbit and Zoe Zebra. 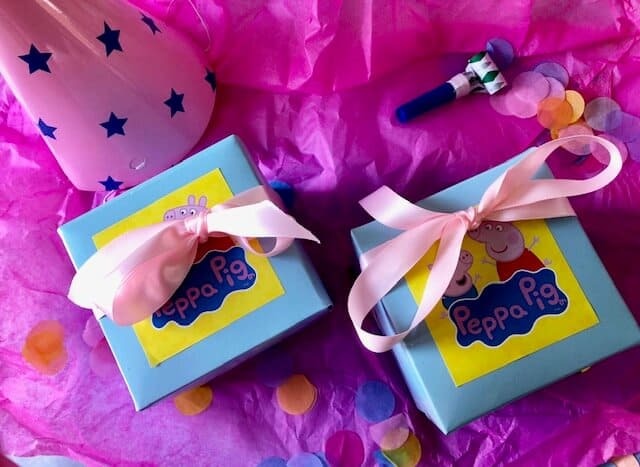 Plus there are party hats, accessories, a party gift box and more, each time a Peppa Secret Surprise is unboxed. 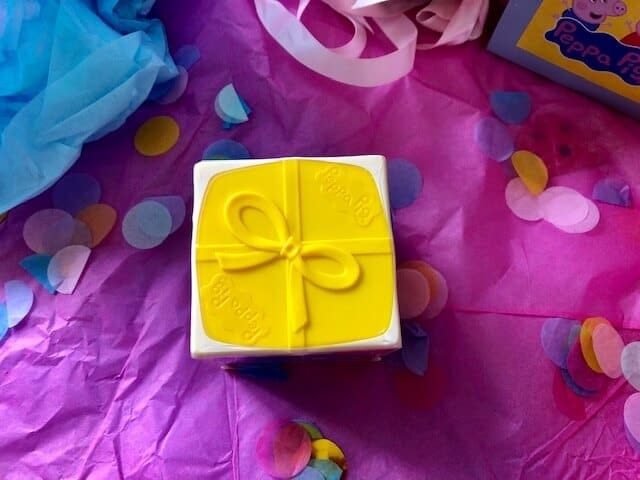 Ensuring that collections are kept fresh, Series 1 will launch in December in the UK, with a yellow surprise box and a Party theme. This will be swiftly followed by new series in 2019, which will feature new coloured boxes, and a brand new theme of figures and accessories to collect. There are very few collectibles on the market that hold lots of surprises and one that keeps on giving. Peppa’s Secret Surprise is just this. When we thought we had finished unboxing all the compartments we found another! The collectible from Character is a decent size and comes wrapped in the plastic as show above. It doesn’t show you whats inside, just gives a little teaser with – it contains a figure, accessories and a sticker sheet. 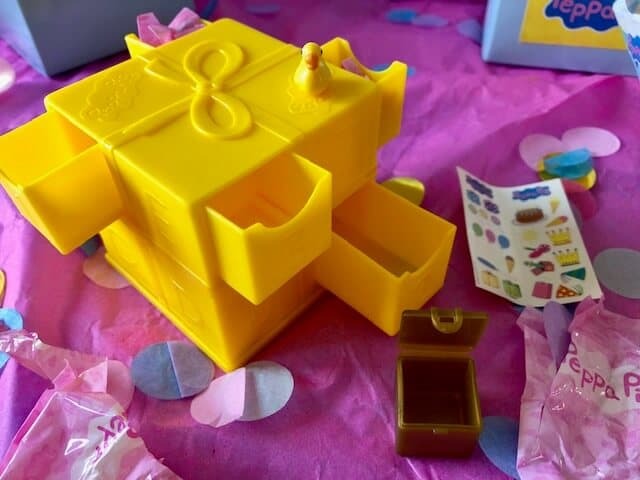 Each surprise is sealed inside Peppa’s Secret Surprise cube. All the little drawers on the cube are numbered, so you can open them in order. The sides that don’t have the drawer has letters on them. So as well as learning numbers, you can help your preschoolers with their letters as well. 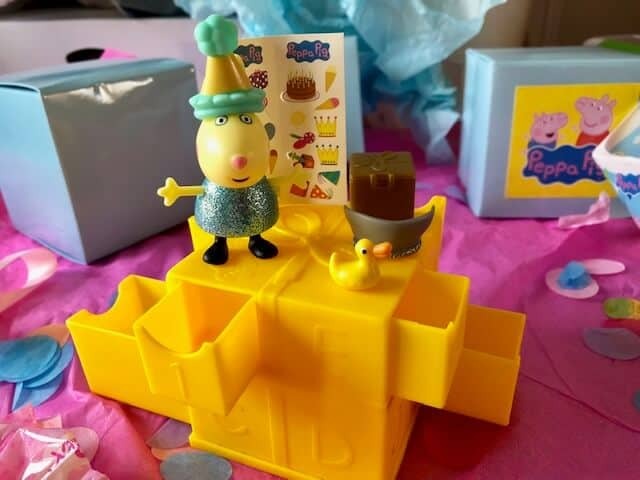 We got the figure of Rebecca Rabbit in one of our surprise boxes, as well as the sticker sheet, gold chest, little duck and a tiara for Rebecca. I love the idea of the cubes (that are designed to look like presents) to use as a stand for your figures. Or you can pop them away back in the drawers for safekeeping. Overall, I think the Peppa Secret Surprise collectible is a great little toy for preschoolers. 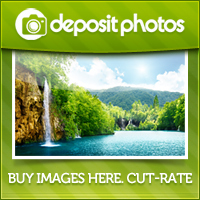 Some parts are small so I would advise for ages 3 – 5 years. It will provide a lot of fun. Priced at £9.99 it’s a little steep for a pocket money treat, but fantastic for birthday’s and Christmases. Thanks for stopping by today, I hope you have enjoyed our Peppa Secret Surprise unboxing. You may like our other reviews in the toy category right here. 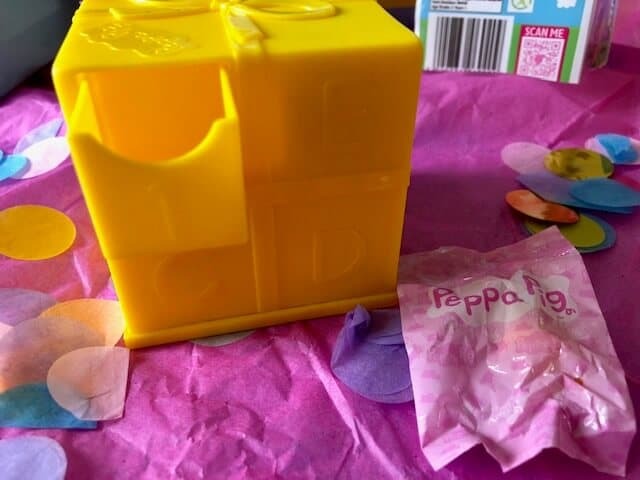 *We received the Peppa Secret Surprise boxes in exchange for this post, all thoughts and opinions are my own.